NSA cracked Kryptos statue before the CIA. The encrypted Kryptos statue at CIA headquarters. 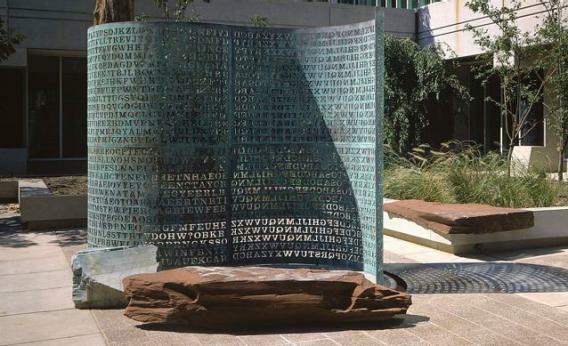 In the central courtyard of CIA headquarters stands an odd statue—in the shape of a 12-foot-high, S-shaped wall with letters punched out of it—named Kryptos (the Greek word for “hidden”). The statue, created by Jim Sanborn and installed in 1990, is more than just a curious piece of art, though. It contains four different encrypted codes that have served as a topic of discussion and distraction for cryptanalysts around the world. It was nearly a decade after Kryptos was created before CIA analyst David Stein and computer scientist Jim Gillogly, working independently, cracked the first three codes within a year of each other. Both men gained public attention and notoriety in the field of cryptography for their efforts. But, as Wired reported on Wednesday, new documents obtained via FOIA request by Elonka Dunin, an expert on Kryptos, tell a different story. A small team of cryptanalysts at the National Security Agency—yes, the one and the same—worked out the first three codes on Kryptos years before Stein or Gillogly. And it took them less than a month to do so. All they needed was a formal challenge from the CIA’s then-deputy director, which inspired a few NSA cryptanalysts to sit down, work out three of the puzzles—the fourth code in Kryptos remains a unsolved to this day—and report back with their success in June 1993. These mysterious, ancient geoglyphs extend out over 85 miles of the Nazca desert in Peru. Made by brushing away the dark top layer of the desert, the full picture of each of the hundreds of gigantic geometric symbols and animal shapes can only be seen by climbing the local foothills or flying over them for an aerial vantage point. Researchers have studied the Nazca Lines for almost a century but are still unsure about their purpose. No doubt an NSA cryptanalyst figured out long ago that Nazca is some kind of alien landing strip or for wayward extraterrestrials in need of some navigation. In the late 1960s and early 1970s, the Zodiac Killer rampaged around California, claiming to have murdered 37 people. Police, however, blame the killer for seven victims, two of whom survived. Zodiac’s identity remains unknown. But in a cryptographic twist, the killer taunted the police and public by sending a series of encrypted messages to newspapers, some of which have still not been solved. I think it’s safe to say that this would be child’s play for those NSA’ers—Zodiac was likely taken care of long ago by a swift, targeted drone strike. This 600-year-old book, which is described as “the world’s most mysterious manuscript,” is written in a language that has never been seen elsewhere and, as NBC News reported in June, is filled with “intricately drawn illustrations: plants that can’t be identified, astrological symbols, elaborate networks of pipework and naked ladies dancing or bathing in a strange green liquid.” Scholars have yet to decipher the origin or contents of the strange tome. And that’s just the way the NSA wants to keep it. Otherwise they wouldn’t be the only ones that get to enjoy and exploit the secret knowledge held within the manuscript’s pages. In 1999, the body of Ricky McCormick was found in the middle of a cornfield in West Alton, Mo., 30 miles from his home. The circumstances and cause of his death remain undetermined, but the FBI soon became involved in case because of two encrypted notes that were found in his pocket. After trying their best to unlock the cypher, which could provide details of the murder or end up just being a mundane grocery list, the FBI posted a public request for help in 2011. The code scribbled on the notes has still stumped cryptanalysts, though. That is, except for the bored code-breakers at the NSA, who have probably just failed to communicate the meaning of the notes to the FBI. If you have other theories or suggestions for cryptographic mysteries that the NSA may have taken a crack at, let us know in the comments below.